When Congress adjourned in September, it had failed to vote on resolutions on Ethiopia (S.Res. 432/H.Res. 861). When it returns, it should pass them without delay. Ethiopia, an important security partner and ally, is heading for crisis. The country is suffering its worst unrest in years in response to the government’s intensifying abuses and restrictions on freedoms, as documented by Freedom House. On Oct. 8, for the first time in the ruling government’s 25-year history, a state of emergency was declared. Thousands of people have since been detained. The pending resolutions condemn the killing and arrests of protestors and journalists by security forces and call on the U.S. government to review security assistance and democracy strategies for Ethiopia. They are an important first step in addressing the crisis in Ethiopia, and a needed pivot from current inaction by the U.S. government. They should be passed for these reasons. Unrest began in November 2015, sparked by the government’s plan to expand the capital by seizing land from farmers in Oromia. This region produces most of the nation’s wealth and is home to the Oromo, Ethiopia’s largest ethnic group — and one of its most marginalized. 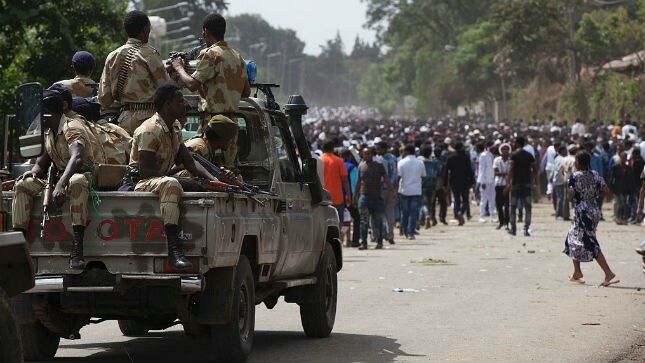 After security forces brutally responded to peaceful demonstrations, protests expanded, encompassing abuses and restrictions on freedoms and the dominance of Tigrayan elites in the country’s political and economic structures. The ruling political coalition, the Ethiopian People’s Revolutionary Democratic Front (EPRDF), is led primarily by members of the Tigray ethnic group, which comprises about 6 percent of the population. Ethiopia’s constitution commits the EPRDF to uniting Ethiopia’s more than 80 ethnic groups. Instead, the EPRDF’s policies have fueled ethnic divisions and distributed economic wealth and political power to the Tigrayan People’s Liberation Front (TPLF) and political loyalists. Following the 2005 elections, when the opposition won a third of the seats in parliament, the EPRDF clamped down violently, jailing opposition and enacting laws effectively eliminating independent media and civil society work on human rights, governance and elections issues. The EPRDF has continued to consolidate power, “winning” all 547 seats in parliament in 2015. Before the state of emergency, the situation was already serious. More than 500 were killed and tens of thousands injured, arrested or disappeared. The state of emergency — the full text of which is still not public — makes tensions worse. It imposes a strict curfew, travel restrictions on foreign diplomats, limitations on social media, and prohibitions on protests and opposition-supported television channels. Security forces are going house-to-house searching for violators. 2. U.S. policy hasn’t worked. The severity of the situation is not disputed, but some policymakers argue private pressure would be better than public resolutions. Unfortunately, private pressure for the last decade has yielded few results. Instead of relaxing restrictions to allow critical voices, Ethiopia has tightened them. The Obama administration’s shifting positions on Ethiopia have proved ineffective. The State Department’s human rights reports document intimidation of political opposition, but last year Undersecretary for Political Affairs Wendy Sherman praised Ethiopia as a democracy with free and fair elections. Since then, the State Department has expressed “concern about recent clashes,” called for dialogue with the Oromo community and was “troubled” by the recent state of emergency, but has remained silent at other key moments. The State Department’s inconsistency and frequent public silence seem to embolden the EPRDF. 3. Passage of resolutions provides clear direction for U.S. policy. The resolutions are mild given the severity of the situation. But they provide key elements currently missing from our Ethiopia policy: a consistent position on the violence and how to address it; clear direction for specific actions by the executive branch; and a call for the Ethiopian government to allow a “full, credible, and transparent investigation,” the results of which can be used to inform a more robust U.S. response. The Ethiopian government’s current repression is destructive, not only for the EPRDF, but for Ethiopia’s long-term economic growth and effectiveness as a security partner. In order to thrive, it must uphold the rights enshrined in its international commitments and its own constitution. Passage of these resolutions will send this message and will provide much-needed direction for addressing the worsening crisis after years of inaction and inconsistency from the U.S.
Boyajian is advocacy manager at Freedom House.